A catenary arch is a type of arch that keeps its members in compression when bearing no load but its own weight. What does this mean and why is this important? The Musgum people make mud homes that are catenary domes. This simply a catenary arch spun into the shape of a dome. Stone, brick and block all have this in common. In compression they are extremely strong. In tension they are relatively weak. The purpose of the arch is to spread the load on the brick in such a way that the brick is always in compression. To illustrate, say that you ignore this rule. Say that you have a door way and you span the top of this door way with a long, solid, thick granite block. This lentil is thus supported on its ends, but not in the middle. The weight pressing down on it will tend to bow it down in the middle. This makes the top slightly concave and the bottom slightly convex. The top surface is essentially getting compressed into a slightly tighter space, but the bottom surface is getting stretched out into a longer surface. The bottom is in tension. The stone is weaker in tension and so, with enough weight, cracks will form on the bottom surface, which will eventually spread to through the lentil, until it comes crashing down. An arch avoids this, by redirecting the pressure in the wall one brick at a time. Properly formed the bricks remain in compression and all the weight of the area above the door is redirected to either side, but always in compression. There is a type of arch, a catenary arch, which is the ideal arch shape if the only weight you are to bear is the weight of the arch itself. 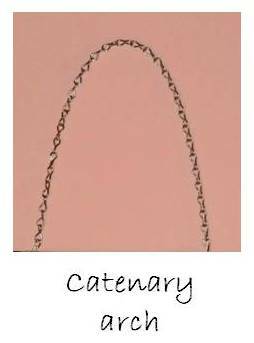 A catenary is that shape formed by a chain, hanging down in the middle when supported on both ends. The word itself comes from the Latin word “catena” meaning “chain”. That graceful loop naturally assumes a shape where all the forces are in tension. Invert it and the opposite is true. 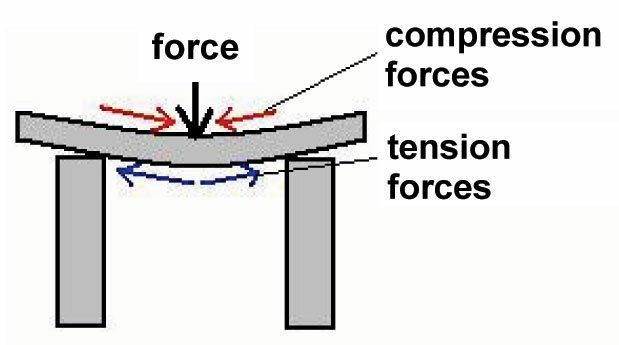 Every force is in compression. The St. Louis arch is almost a catenary. It is very close. An arch supporting itself alone does not seem very useful. In what cases might such an arch be used? If you spin the catenary arch at its tip, you create a domed shaped. If you put a bunch of catenary arches side by side you form a vault. You can make these without any need for outside buttressing. This concept is used when making masonry homes in some places. 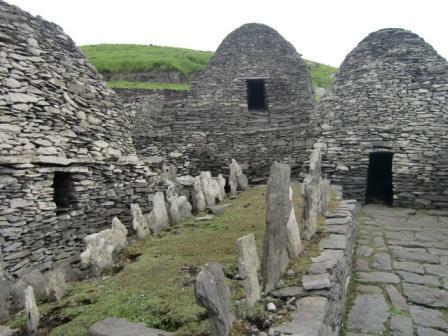 Check out my picture below with these beehive homes used by Irish monks in the Skellig Islands. These were made without any mortar between the stones, and they could do this because the shape is naturally stable. 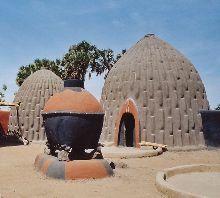 Consider also the mud houses currently used in Africa (see above photo). Closer to home we have domes and vaults being made with sandbags as shown here. While it does turn out to be useful it took the Romans to apply to a whole new set of purposes, as we discover in the next page in our series. Beehive homes off the coast of Ireland. This is also the site used for the final scene of "Star Wars: The Force Awakens".